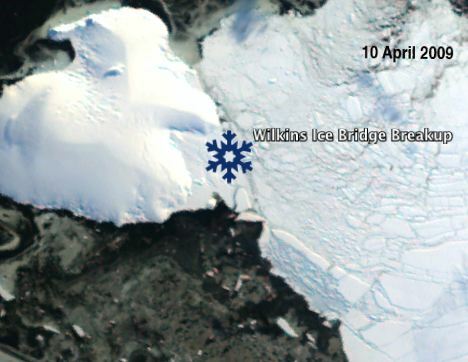 The Wilkins Ice Shelf, on the Antarctic Peninsula, has been breaking up for a while now, and Ogle Earth’s been turning satellite images of the remaining ice bridge into KML overlays (see here and here). Now it’s finally happened: The ice bridge, too, has disintegrated. This time, the US National Snow and Ice Data Center has taken the latest MODIS imagery and turned it into a georeferenced time-lapse series for Google Earth. Download it here, and be sure to animate it with the time slider. Spectacular event, ta for that. That lost ice bridge is in the exact centre of the most intense bulls eye warming on the planet, over the past fifty years. Also, as far as I can tell from poor maps, just where the deep geomagnetic field, generated at the core-mantle boundary, has been weakening most on the same planet. And where the southern aurora in consequence also thickens hugely. I contend that lot makes scientific nonsense of the notion that carbon dioxide is the main driver of the present warming. See the maps on my website above, for that and much else on AGW, or go to ABC Pool in Oz, and put in the surname. We need to scratch our heads a bit, I think.